The Kitsap Public Health District has re-opened the swimming beaches at Island Lake County Park and Island Lake Crista Camp. The beaches were closed on Wed., July 11 due to high levels of E. coli bacteria in the water. Results from follow-up testing show that E.coli levels have returned to a level considered safe for human contact. While the E.coli bacteria levels for the Kitsap Lake Park swimming beach are now at levels considered safe for human contact, the lake-wide cyanobacteria warnings issued for Kitsap Lake and Long Lake on July 10 remain in effect and won't be lifted for at least two weeks. 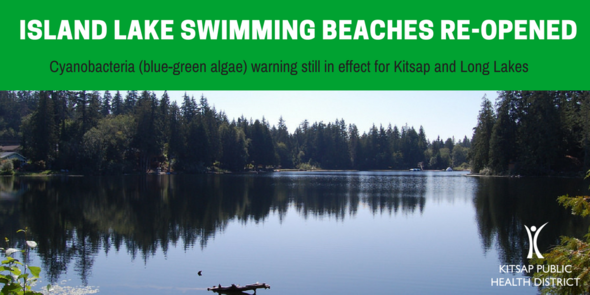 During the summer months, the Kitsap Public Health District monitors 34 fresh and salt water swimming areas for bacteria levels and sources, safety concerns, and toxic cyanobacteria (commonly known as toxic blue-green algae). If people or pets become sick after being in the water, or if you see an algae bloom or large numbers of dead fish, please report it online or by calling 360-728-2235 so Kitsap Public Health can investigate and take action, if necessary.